The Take-Away card is a training accessory that helps to strengthen the learning that has occurred during the team building program. 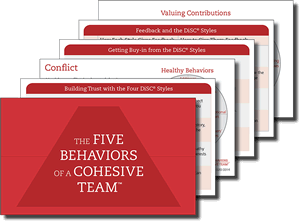 There is a card for each of the Five Behaviors: Trust, Conflict, Commitment, Accountability and Results. The front of the card reinforces the concepts of that team behavior. The back of the card lists each of the DiSC styles (D, i, S and C) and discusses how each style may work regarding the team behavior. Each participant in the team development program receives five cards, one card for each behavior. These high-quality cards are used during the team-building class for activities and can be used in between sessions as a learning sustainment tool.